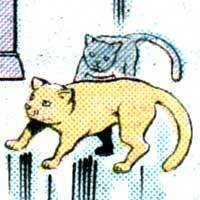 Jack & Jill are a pair of cats given to Booster Gold by United States President RONALD REAGAN as a gift. The cats Jack and Jill had the run of Booster Gold's Goldstar, Inc., offices. The two cats were favorites of TRIXIE COLLINS, who was known to reject Goldstar clients who were impolite to the cats. Booster Gold very rarely was seen anywhere near his own cats, and Skeets I (see SKEETS) had an open distaste for them. When Booster Gold departed Metropolis, the cats were left in Trixie's care. 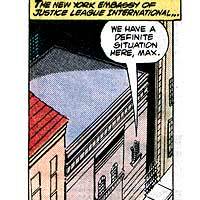 When the JUSTICE LEAGUE gained the sanction of the UNITED NATIONS, they opened a number of embassies around the world. The JLI embassies, located in the world capitals Brasilia, London, New York, Melbourne, Moscow, Paris, Rome, and Tokyo, employed permanent staffs in order to ensure that the public could reach the Justice League in times of crisis. Booster Gold lived in both of the Justice League's New York Embassies for a number of years, though he visited all of them at one point or another. Staff employed by the League includes Joshua Barbazon (Australia), Ernesto Lopez (Brazil), Catherine Cobert (France), Cyndy Kurahara, Inada Akutsu, Rodan Katatami (Japan), Boris Razumihin, Rosa Rubikskova (Soviet Union), and Lisa Morice (United Kingdom).